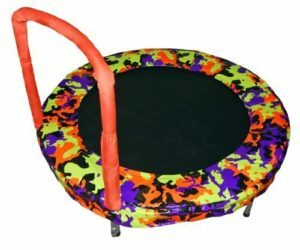 Best Trampoline for Toddlers - Trampoline for Me! Toddlers are fragile. They can be hurt almost anywhere and on almost anything. They are not easily entertained. You know, sometimes they can just be a burden. But then, if you think about buying some toy for them that they won’t get tired of (think of trampolines), you have to make sure that it’s perfect for them in every way – safe, stable, entertaining enough, not scary. I’ve been there. Both of my kids were toddlers once, of course. And as I like trampolines, I wanted to give them the experience of jumping early on. Now, that is probably the most research I’ve done in my life – but it paid off. Oh, and countless quarrels with my wife were difficult, but now my kids say it was definitely worth it. However, we were able to resolve those fight as well – as you will see below, we found one which can support up to 150 pounds! That way my wife could be there and jump with our kids which really made them happy. It’s not that I didn’t want to, it’s just that I’m too big. Onward. Pediatricians also recommend using trampolines to encourage children with rhythmic bouncing, which is said to improve language learning, as well as for overall body activity! If we train our bodies when we come to a certain age and do it so for reasons other than looking good (feeling good, getting our minds clear or whatever else) why shouldn’t we give our kids the same luxury? 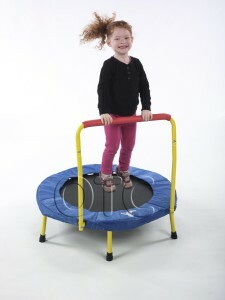 I will give you an overview of the best trampolines designed with toddlers in mind. They are not that responsive (you can’t jump really high on them), really safe and secure and a toy that your little one can keep on playing with for a long time. So, whether you have a 1 or a 2-year-old baby, this page is perfect for you. Although manufacturers say that some of these are for kids up to 10 years old, in my experience bigger kids need a little more thrill, which is why I made a separate page for bigger kids (4-10 years old). All of the trampolines have their cons and pros, but I will try to grade them by popularity among my friends (and family) and other people I’ve met (and read about online). In the last couple of years, there have been a lot of customer complaints about safety, especially when it comes to kids (click here and here for more information). This is, however, a problem that is being overcome by the latest models – they provide much safer options today. That being said, you should consider carefully the type of trampoline you’re willing to buy for your kid and you should never leave your kid unsupervised. This is my number one pick for several reasons. So let’s talk safety first! This little one has 6 instead of standard 4 legs which provide for more stable construction. There are no springs here – they are replaced with series of heavy duty elastic straps, which makes it even safer. These are more durable than traditional bungee cords, so they are a great alternative to springs. Also, the side is padded for obvious reasons: so that your kid can be inside the circle of jumping and stay out of potential trouble. It is able to support up to 150 pounds so that a mommy can jump with her kid as well. It is lightweight and can be folded, as its name implies, to a really small space – and unfolding is as simple as one two three – you just have to screw the legs on and put the handle. That’s it! Now, as you can notice, the handle is only on the one side. This makes it easier for bigger kids (50 pounds+) to make the back legs might lift off a little if they jump high. No one I know reported that their kid actually turned the trampoline over, but it is worth mentioning as this can be considered a flaw. So, when your kid gets heavier, you should consider attaching dumbells on the back legs, just to make sure everything is in order. It is 36″ in diameter, elastic enough to make your kid happy but not enough to make it fly and potentially hurt itself. That is all there is to know about this one – and it is my favorite for the apparent reasons – it’s safe, durable, light, and my wife could jump with kids. Splendid! Click here to view this Fold & Go on Amazon! This is our number two pick. It comes with a fully padded removable handle so if your kid likes to bite, you might just go with this one. Moreover, the handle can be easily adjusted to two different heights. It has the 6 legs and is classified for up to 100 pounds. As the name implies, it is bigger than the last one – 48″ in diameter! 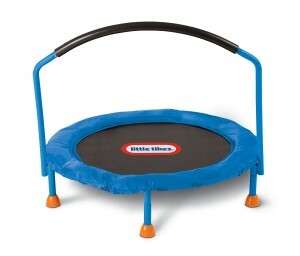 This is actually the only bigger trampoline I’ll suggest here. So, everybody I talked to said that it is nice and durable, that kids can’t jump too high and it is also padded on the sides, which provides extra safety. Now, the one thing I don’t like with this one is that it has springs – which almost every trampoline has, actually – but the last one didn’t. Springs make it a little more unsafe, but a little more durable. Yet, they pose a pinching hazard, so keep that in mind if you opt for this one. Also, as with the last one, there is a possibility that the back legs won’t be on the ground some of the time once your kid gets heavier than 50-60 pounds. As I said earlier, you can make up for that flaw by attaching some weights on the back legs. All in all, our #2 pick is still a great pick which provides a lot of fun for your kid, it is really safe, durable and also bigger. Click here to view Bazoongi little bouncer on Amazon! This cute little thing is something you can lean on if you’re tight on budget as it is only about 50$. 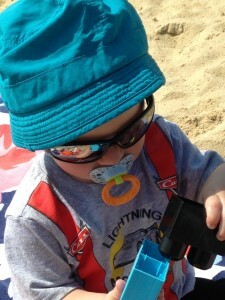 It is a really reliable, portable and sturdy option for little kids. Those were my top 3 picks – the favorite one, the bigger one and the safer (budget) one. If you have any comments drop them in the contact form. 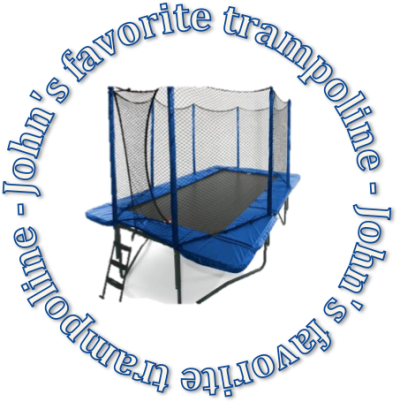 Also, if you’re looking for trampolines for bigger kids (ages 4-10) you can find them on this page.